Cocoa powder and chocolate chips unite in these crunchy, twice-baked Italian cookies. Lightly grease a cookie sheet; set aside. In a large mixing bowl, beat butter with an electric mixer on medium speed for 30 seconds. Add sugar, honey, cocoa powder and baking powder. Beat till combined, scraping sides of bowl occasionally. Beat in eggs and vanilla till combined. Beat in as much of the flour as you can with the mixer. Stir in any remaining flour. Stir in almonds and 1/2 cup semisweet chocolate pieces. Shape dough into two 9-inch-long rolls. Place rolls about 3 inches apart on prepared cookie sheet. Use your fingers to slightly flatten each roll till about 2 inches wide. Carefully transfer the cooled rolls to a cutting board. Use a sharp serrated knife to cut each roll diagonally into 1/2-inch slices. Place slices, cut sides down, on 2 ungreased cookie sheets. Bake in a 325 degree oven for 8 minutes. Turn slices over and bake for 7 to 9 minutes more or till dry and crisp. Transfer to a wire rack and let cool. Meanwhile, in a small saucepan combine the white baking pieces and shortening, if you like. Cook and stir over medium heat till chocolate is melted. Dip baked biscotti into melted mixture and place on waxed paper until set. Makes about 30 cookies. 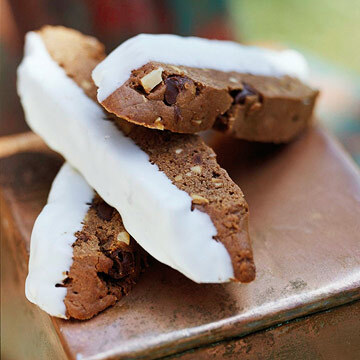 Cool cookies; place in an airtight container and store at room temperature for up to 3 days or freeze up to 3 months.